SP snaps are plactic and available in 14, 15, 16, 18, 20, and 24 ligne sizes, all components can be dyed in custom colors; tops are available in optional glossy or matte finishes. On most basic applications, the "SP" snap system can be attached without pre-punching the fabric or substrate material. Note: In special cases, some SP components have cross compatibility between size groups. 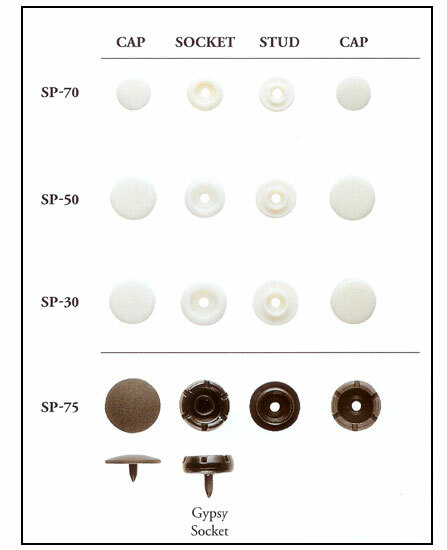 "SP" snap fasteners work well on woven fabrics, nonwoven spun bound type fabrics, and sheet type fabrics (e.g. vinyl, ect.). It is recommended that these fasteners are not used on knit fabrics or substrates that are not stabilized. Attachments can be made using an approved foot press, pneumatic foot press, electric flywheel pass or a fully automatic WB-200 attaching machine. All applications and equipment should receive manufacturers' approval before production.